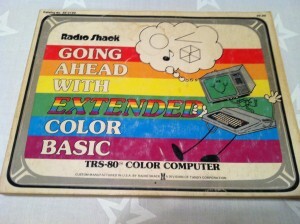 I got my first personal computer in 1980 – a TRS-80 Color Computer with 16K RAM and Extended BASIC! It was probably the best birthday gift ever. I didn’t have the money to buy this for myself, I just asked (perhaps my mother would recall it as incessant begging) for it for months. Many months. I was so sure that this would be my first computer that I bought the BASIC programming manual for it months before my birthday. I read and studied that book nearly every day until I practically had it memorized. I copied the sample BASIC programs, worked through them step-by-step to understand every single line, and even started writing my own BASIC programs (even though I had absolutely no computer to actually test any of these programs on!) I did it all on paper and in my head by pretending to be the computer. 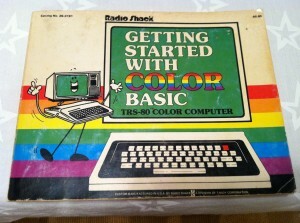 After I received the computer and learned that I had been given the luxury model with 16K RAM and Extended BASIC, I bought the second BASIC programming manual and immediately got started. Yeah, many of those program I wrote before I received the computer did not work properly, but they were probably about 80% correct, and I had taught myself elementary programming in BASIC without even having a computer. Within a few days I had learned how to correct my mistakes and started to extend my knowledge and skills. I think I came home from school every day and immediately turned on the computer, only willing to leave it when called to dinner or when told to go to bed. I knew that computers could do so much. I had watched enough science fiction movies to know that they could analyze data, speak, play games, and destroy the planet. I had purchased some programs – they came on cassettes or on cartridges that could be plugged into a slot on the side of the computer (just like Atari video game cartridges), and a few of them enthralled me, especially my first experience with voice synthesis. It didn’t sound natural, but it was AMAZING! I had to learn how to enter each word I wanted it to speak phonetically using a special code for the different phonemes in American English. It wasn’t long before I realized that the programs I had written were simplistic, yet I couldn’t afford to buy complex new programs very often. I wanted to do more with my computer myself, so I subscribed to newsletters and magazines. These were the early days of personal computers, the Apple Macintosh and Microsoft Windows were still 3+ years in the future, and desktop publishing hadn’t yet arrived, so the newsletters were often typed, copied (or even mimeographed), stapled, and mailed. Using the programs in the magazines and newsletters as models, I started to write more complex programs. My computer did not have a disk drive – it stored everything on a cassette tape (probably 300 baud at best), and all programs had to be loaded one at a time, each time the program was needed. There was no multi-tasking, so you planned your time on the computer carefully to minimize the number of times you had to load and unload programs. 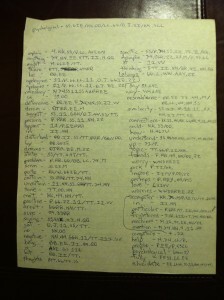 As my programs got longer, I needed to write them down before typing them in, because I hadn’t learned how to type, and my data entry was slow. It might take me several evenings after school to type in long programs from the magazines or that I had written line-by-line on many pages of notebook paper. I needed a place to store all of my notes, instructions, and programs, so I used a folder from my school supplies. Yes, that is a unicorn on the cover. 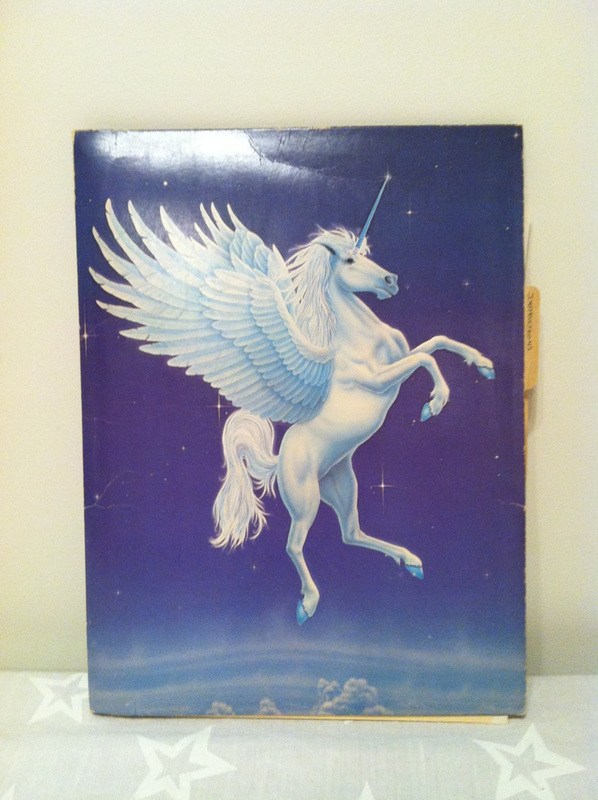 Unicorns must have been very popular among Junior High School students in 1981, and I must have been very interested in them. Maybe it was their mythological status or their magical abilities, but I clearly saw the need to have them adorn my self-taught computer programming materials. Thirty-two years ago I somehow knew that I was supposed to become what today we call “unicorns” – people who are proficient at UX design, visual design, and front-end development. I fear I have failed on this quest, having spent much more time practicing UX design, though I have always been interested in visual design and development and continually tinkered on the edges of both. In 1981 I had no plans for a career in computers. I wanted to be a scientist, and I would go on to earn a Ph.D. in Applied Psychology and spend many hours in labs, making observations, collecting data, and conducting analyses. But it’s funny how our early selves sometimes seem to know things of which we are not yet consciously aware. I changed careers in 2000, almost twenty-years after receiving that first computer, so that I could focus on applying my psychology skills to UX design. I had not originally planned for this, and I certainly did not see it coming in 1981, but here I am today. And maybe I was not intended to be just a unicorn, but a double unicorn! Maybe I was always meant to be a scientist-designer. 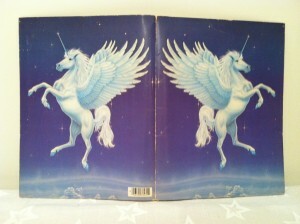 Yes, both the front and the back of the folder are adorned with fantastical unicorns! Without planning it and without realizing what might be way back in 1981, I have spent the last 13+ years focused on bringing together my skills in psychology and UX design: they are my two unicorns. I’d like to extend special thanks to my parents. My mother has graciously stored these items in the attic all these years and took these photos (except for the computer itself, which we gave away many years ago…), and my father (whom I miss so very much) worked many long overtime hours to save the money to buy that first computer. Both of my parents have been amazingly supportive, trusting, loving, and confident in me and that I would find my path. It may have taken 32 years to get here, and I may not know what comes next, but I know I’m on a right path. Thanks and all my love always. You have been such a joy in our lives. We always knew you would achieve your dreams. You are a wonderful son and an amazingly unique person. You have made us both so very proud of you. Thanks for sharing your memories and thoughts about your first computer(s) and learning programming! I find it wonderful that your mum left you a comment here. Beautiful. Really enjoyed this. My first computer was a TI-99/4 that my parents gave to me for Christmas. Note the terrible UX of the button keyboard for which this product was much maligned. I spent my days, much to my parents chagrin, in my room copying thousands of lines of code to build rudimentary basic games as published in Byte magazine and putting the tear sheets that I’d keep in a Mead Trapper Keeper. In my current line of work, brand advertising, I’m still in front of a computer realizing some of the vision that I read about in the pages of Byte. We even refer to ourselves, in nerd humor, as “digital unicorns.” I really salute my parents for investing in the revolution I guess we’re still calling the Information Age, because I know at the time the cost of that home computer was an enormous expense. They still have no idea what I’m doing with myself all day. I have my original CoCo taken apart at the moment. I’ve decided to un-stick the keys and give it good cleaning. This machine was my 2nd computer … and like you my parents bought it for me. My first machine was a Timex Sinclair X81 (I still have that too). Working all summer I was able to earn $99.00 for the CoCo 64k upgrade so that I might be able to code in more than four colors. Our family was very poor and we lived in the country (rural Texas). I really had nothing going for me and this machine changed my life. Thanks for your website. Brought back good memories. That’s a great story, thanks for sharing! I never got the 64K RAM upgrade for mine, but I did use it for years until I left for college. 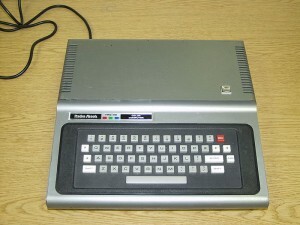 I also remember the Timex Sinclair – I think I even tore ads for both computers out of computer magazines and put them on a corkboard in my bedroom to set goals for myself. Are you now working in the computer, software, web, or technology fields? Funny how our early experiences shape us in ways of which we are unaware.